Terry’s last post got us on a Customer (NO) Service line of thinking, so I might as well stay on course. The photo is of my best friend, Boogie. 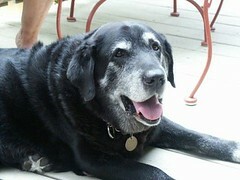 He’s a 12-year old black (with a lot of gray, like me) lab and the best damn dog in the world. For years, from the time I got him, I worked from home and me and Boogie hung out together. He was my VP of Customer Relations. He thinks he is human, and sometimes I think he is. Anyway, Boogie has slowed down a lot the last year or so. Had to quit walking 2 miles a day with me and the wife about a year and half ago. He was still making it a couple of blocks twice a day – morning and evening. He loves to walk. He had his annual checkup in October. We discussed his slowing down and how he seemed to be in a little pain. The Vet recommended Rimadyl. Rimadyl is a non-steroidal anti-inflammatory drug to help reduce pain. We tried it on Boogie and the difference in him was unbelievable. He is a new dog. The stuff worked on him. He’s back to walking about 1/4 mile in the morning and evening and he has his smile back. He is better! Now his current Vet is his Vet by default. Boogie’s previous Vet was outstanding. Her name was Dr. Karen. He had her for many, many years. Due to highway construction, she lost her building. She opted to join a Vet practice outside Atlanta, where we live. We continued to go to her for a couple of years until last year, Dr. Karen opened another practice about 60 miles out of town – too far to drive for us. So we stayed with the practice she had joined. Now this Vet is OK but nothing like Dr. Karen. Boogie LOVED her – got excited when you said, “Let’s go see Dr. Karen.” He knew her name and he wanted to see her. How do they know? They just do. Back to the Rimadyl. The new Vet OKs Boogie to stay on Rimadyl after some blood tests. We get the first prescription. The price floored us. About $2 a pill. Now, I don’t mind the $2 a pill if it makes Boogie feel better. But we checked with 1-800-PetMeds and found they had the same pills for about $1.10 a pill. So we tell the Vet. We would rather support your practice and buy the presription from you but your price on Rimadyl is a little high. The Vet won’t come off the price. So we ask for the prescription so we can send it to 1-800-PetMeds. The Vet did not like this request. But a buck is a buck, right? We make an order on 1-800-PetMeds. They call the Vet to verify the prescription. The Vet tells PetMeds they don’t deal with PetMeds and hang up the phone. PetMeds contacts us and says we must fax them the hard copy prescription. We get the prescription from the Vet and fax it in. PetMeds calls the Vet again yesterday and they refuse to verify the prescription – stupidology. Now, we have to mail the hard copy prescription in so we can get the Rimadyl from 1-800-PetMeds. How stupid is this? The Vet, Dr. Greedy, just lost a steady, paying customer. If she had offered the pills at a reasonable markup, I would have paid for the convenience and to support her practice. But double the price? No way. And the way they refused to assist PetMeds in filling our subscription – which they had given to us – is absolutely wrong. I am a business person and totally understand how to run a profitable business. I understand markup. I understand a reasonable profit. I don’t understand ripping people off and not being helpful to long-term customers, or any customer, for that matter. Dr. Greedy doesn’t get it – life ain’t brain surgery. Being nice to people and being cooperative will get you further than being mean and greedy. Good-bye, Dr. Greedy. Rot in hell! Like most of us I have suffered through the typical lack of service at most Big Box stores. Should we learn to accept this behavior as a result of the culture in today’s America or fight this attitude and try to be a change agent in a difficult and unruly world? My crusade to change this behavior has met with dismal failure. Partially due to a lack of continual haranguing of management and partially due to the total ignorance of proper manners by some individuals employed at Big Box retailers. Management is between a rock and a hard place because they need warm bodies in front of cash registers in order to take our money and then listen to us complain about the lack of service. In some instances the manager has had very little if any training at customer relations and certainly little training in the art of managing uneducated employees. Allow me to relate a quick example. Last week I ventured into a local Wally World Mart for the purpose of purchasing two, that’s correct TWO IPOD’s. My daughter and her husband both want one for Christmas. The store I chose happened to be in a culturally deprived part of town but it was close to my workplace. At the electronics counter I encountered three employees eating potato chips and drinking soft drinks. They were pleasant enough but absolutely zero help. Finally after a couple of minutes the older of the three asked if I needed help. Why yes I replied I would like to purchase two IPODs. She asked me to wait a minute while she paged another employee to help me. Being in a jovial mood and with some time to kill I figured what the heck, I need an adventure and some laughs. In about 10 minutes a young man approached and looked at me without saying a word. He was about 6 feet 4 and 300 pounds and was unhappy he had to be disturbed. He looked at potato chip lady and asked her something to which she responded with a point in my direction. He mumbled something at me and I responded “IPOD” and off he went toward the IPOD display case. I pointed to the style I wanted and he opened the case and immediately dropped one on the floor. Not missing a beat he took two, (including the one he dropped) to the sales counter. Here we were greeted by another employee wanting to buy a bag of chips with her employee card. Naturally he took this employee in front of me and began trying to check her out. Her card would not work and I was treated to another show of vast ineptness and lack of cultural skills. At this point one of the original potato chip ladies looked at me and said you need to go to another Wally World Mart because we do not know what we are doing. I took her advice only after telling Fat Albert that I had more shopping to do and would be back to get my IPOD’s later. I got them at another store. I might add that I attempted to see a manager at the store above and then I crossed town and ventured into another store and tried to find a manager with whom to offer some advice. I failed in both instances because I was told all the managers were at lunch. A wry plan by management I might add. Always be busy when a customer wants to speak with you because you might have to make a decision. Did I get angry and fume and fuss about the money I was spending in these stores just to be treated like a non customer? No, I have learned to laugh and realize how sad our society has become. Those working at big box retailers do not have any idea on how to get out of the cycle they are in. They will continue to act the same way and demand more from Wally World and expect to work less. I cannot be mad at the individuals because our government and society have created this attitude through dumb policies. What I can do is refuse to spend money with organizations that do not appreciate my business and refuse to properly train employees.